At a well-executed nonprofit event, you’re able to re-engage your audience, strengthen relationships, expand your reach, and generate serious income. Classy’s registration with fundraising software enables event attendees to fundraise for your cause leading up to an event, so you not only meet these goals but grow beyond geographic or logistic constraints. 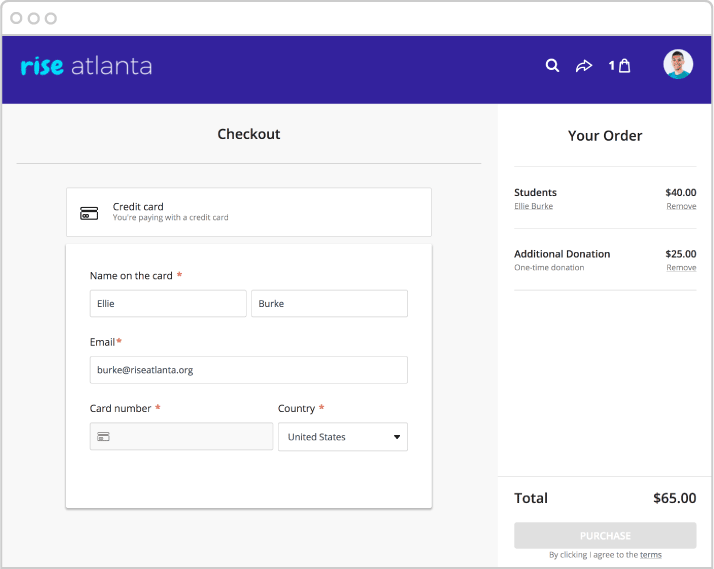 To help nonprofits raise the bar year over year, we’ve made exciting new updates to our product and to the registration with fundraising process that we’re eager to share. Prior to our redesign, Classic Registration with Fundraising on Classy offered limited customization options. 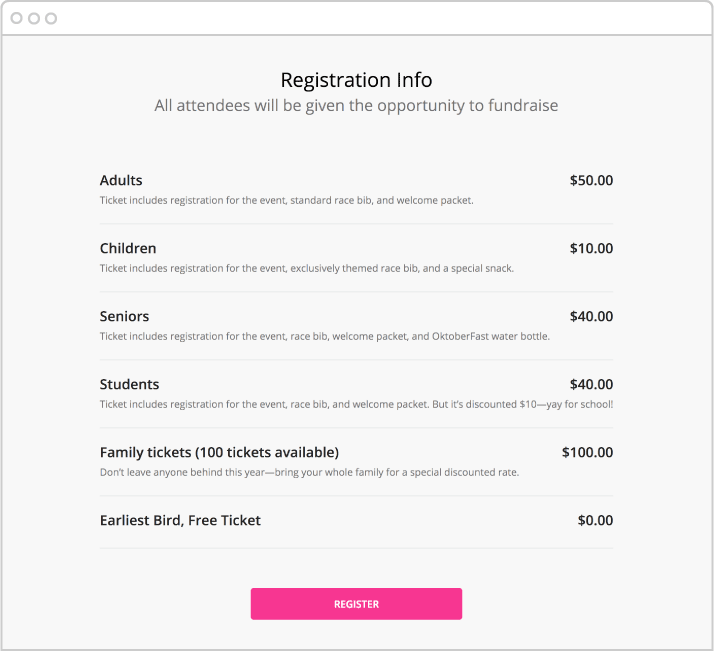 The new Registration with Fundraising event includes modern, mobile-responsive design and nearly endless customization options out of the box. You also have the ability to add, delete, and reorder blocks as you see fit. This allows you to ensure the most important information is front and center. For example, you might decide to move a registration information block up so that it’s higher on the page. This type of block makes it easy to feature the different types of registration that you’re offering for an event. As you design your page, you can also save time by creating a design theme. Upload a few basic elements like your colors and logo, and they can be pushed out to the additional pages associated with your event as you build. Beyond versatile design updates, changes were also made to the checkout process with today’s highest standards in e-commerce in mind. Mobile-responsive pages allow your supporters to view your page from any device and register for your event on the go with ease. The registration process itself models an e-commerce shopping cart experience, making the process feel familiar, intuitive, and fast. In fact, the new Classy Pay technology has simplified the checkout process entirely to increase conversions on your page. A supporter now only needs to enter their name, email, card number, and country to complete the purchase. That’s not the only improvement to the customer experience. The new cart reservation system now includes a timer that reserves tickets for customers. Whenever someone selects tickets for their cart, the tickets are reserved and protected from selling out for a set period of time. Supporters also have more flexibility in the checkout process than ever before. Registrants have the option to add a one-time or recurring donation on top of their registration. They can even cover the fees associated with their gift. After an attendee signs up and registers for your event, a fundraising page is instantly created for them. 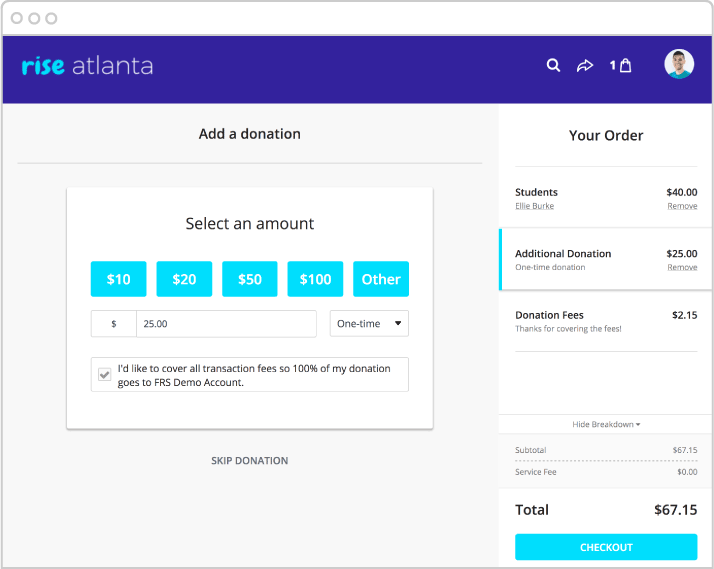 This saves time in the fundraising onboarding process and gets your fundraisers up, running, and banking their first donations. Classy also added new time-saving attendee management tools to help you better support your registrants. A new, powerful search functionality allows you to easily locate, edit, and manage your attendees directly in the campaign dashboard. Search by name or email address. Because we know it can be challenging to manage your attendees and update their information, we also added new levels of control for event admins. Now, you can go into your fundraisers’ pages and make edits that serve your supporters and protect your brand. Registration with Fundraising also includes all of the powerful features from Classy Peer-to-Peer. Registration with Fundraising combines the best of multiple worlds, allowing you to better manage your events and equip your community to raise money on your behalf. We’re thrilled to roll out these new updates, but you can rest assured there are even more to come. To stay in the know about the latest product updates, subscribe to our blog below. Ready to see a demo of Registration with Fundraising?